When I was ten or eleven, I had a teacher who required us to memorize and recite poetry. 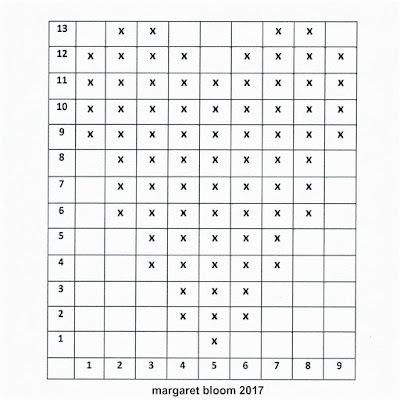 It seemed like a strange, old fashioned exercise, but as an adult, I'm glad to have memorized these poems (and continue to be amazed that I can still remember them). So today, humming through my head are the first lines of the poem by ee cummings, "and it's spring when the world is puddle-wonderful..." (you can read the full poem HERE). And what could possibly be more "mud-luscious" and "puddle-wonderful" than frogs? Bean bag frogs from THIS pattern over at Purl Soho! 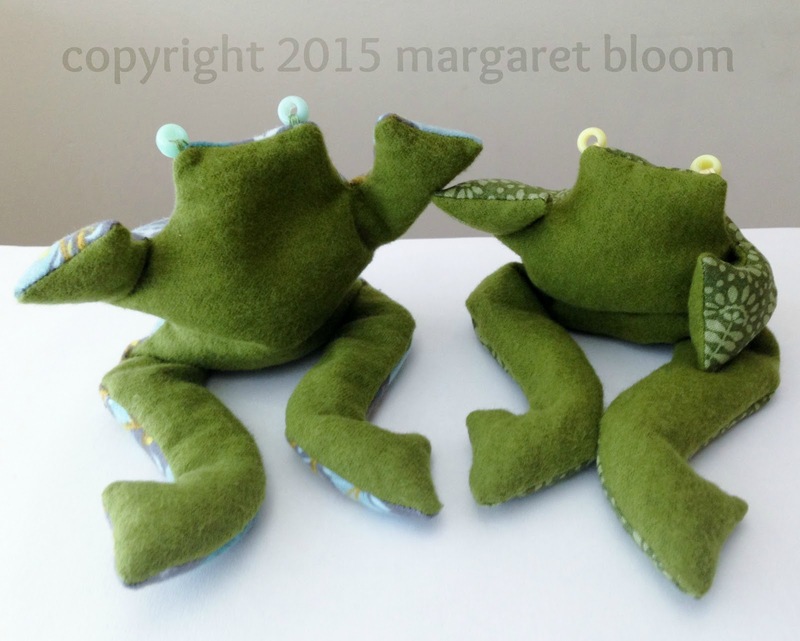 I made these guys a few years ago; when they are not flopping around the house, they spend their time reclining languidly on book shelves (and posing as hats). How are you welcoming spring this year? My birthday was last week. I made an ice cream cake (above), received cards, phone calls, emails + messages from near and far, a hug from one son, a hastily scrawled card from the other, and the most horrible bouquet of flowers from my husband. I adore flowers, but apparently the aroma of Stargazer lilies makes me nauseated (and in an odd twist, my sons felt sentimental about the flowers and became upset when I suggested that the best way to deal with the offending smell would be to send the flowers on a quick trip to the compost; so the flowers hung around the house, making me ill for several days). On the heels of what shall heretofore and forever be known as "the horrible birthday bouquet," a magical parcel arrived on my doorstep from my dear friend Christine in France. The first thing this parcel-of-marvels revealed was a birthday card; you can see the P.S. which Christine wrote at the bottom of the card. After reading this, I went through each item in the parcel, mystified. The final little paper packet revealed... a door! Christine and I laugh when sharing peculiar vocabulary, and so, describing the little house as "biscornu," she asked what the translation might be. The best words I could come up with were lopsided, tumbledown, ramshackle, or simply crooked, which brings to my mind the traditional nursery rhyme, "There was a crooked man and he walked a crooked mile, He found a crooked sixpence against a crooked style; He bought a crooked cat which caught crooked mouse, And they all lived together in a little crooked house." Can you imagine a little crooked cat (and mouse) peering out of that tiny window beneath the roof-peak? Detail upon detail... when I turned the bookmark over, there was a tiny apple tree. The little crooked man, the little crooked cat, the little crooked mouse and the birthday bird, must surely feast well on tiny apple tarts, baked in a little crooked oven, of course. 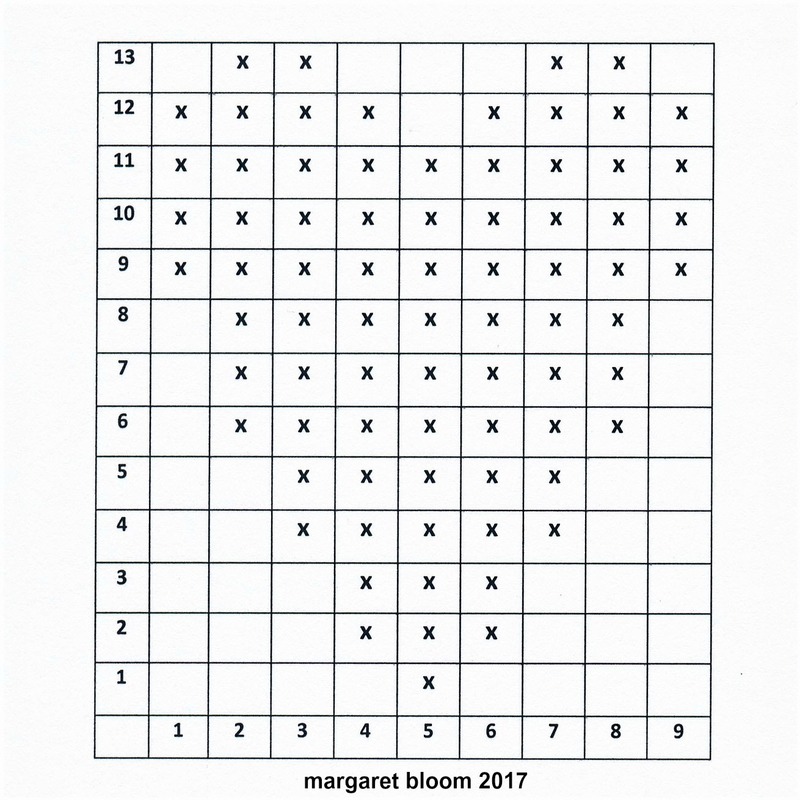 Let's arrange the peach blossom branches. Five court musicians are playing flutes & drums. Today is a joyful Dolls' Festival. Hinamatsuri is celebrated in Japan on March 3rd. For this festival, families bring out a special set of dolls dressed in traditional court costumes of the Heian period, and modern doll designs are popular, too. 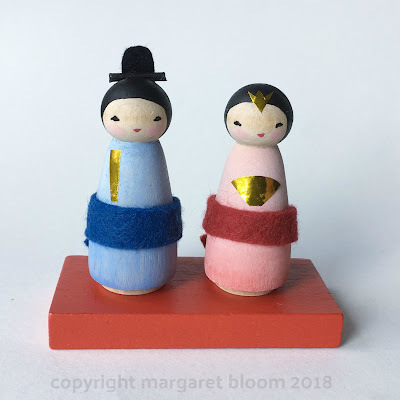 This tradition inspired me to design a set of Hinamatsuri dolls for my first book (Making Peg Dolls, Hawthorn Press 2012), but this morning, I felt like updating my design and making a new set (see photo at top of the post). And my recent entree into the world of Instagram has sparked a renewed interest for me in kokeshi. Via Instagram, I've become acquainted with Laetitia Hebert who runs the shop Folkeshi where she carries a beautiful collection of vintage and modern dolls -- I've become especially enamored with the modern designs of Hiraga Teruyuki and Tayama Izumi. Below are two videos of kokeshi artists at work. They're mesmerizing. 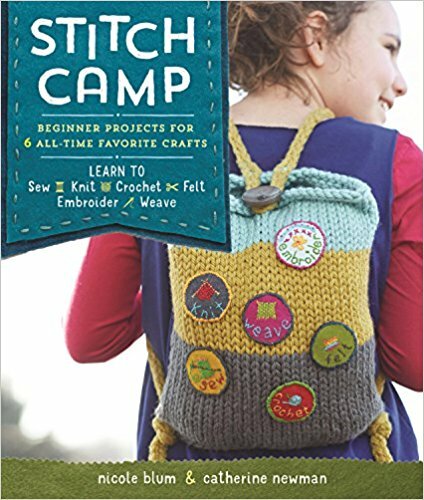 book review :: stitch camp! FTC Compliant Disclosure: I was sent a copy of this book by Storey Publishing Co. to facilitate a review, however, all opinions expressed below are entirely my son's and my own. Last fall, this gorgeous book arrived in my mailbox, and since then, it's been living on the kitchen table in constant use. The moment I pulled it from the envelope, my 7 year old son grabbed it and got to work. First was the bean bag sewing project. Then crochet. Then weaving. And about a month ago he learned to knit. Looking through Stitch Camp, his enthusiasm is hardly surprising. 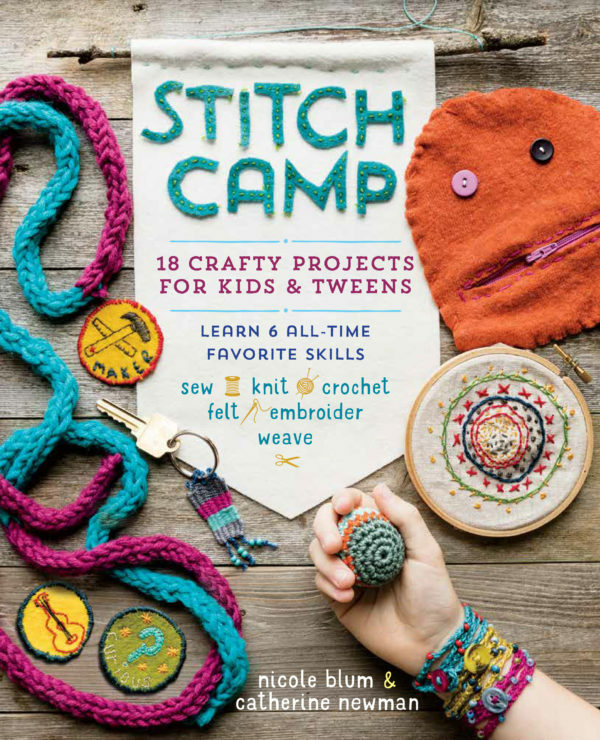 The photos are bright & bold, and the projects are super kid-friendly. I could go on and on about this fabulously fun book, but honestly, I'm not the one who's been using it. Hence, my 7 year old (LB) will be writing the rest of this review. LB: I like this book because you can learn all this cool step-by-step embroidery, weaving, crochet and knitting... It can teach children of all ages and grown-ups. LB: I chose this beanbag sewing project first because it would be fun to play with. 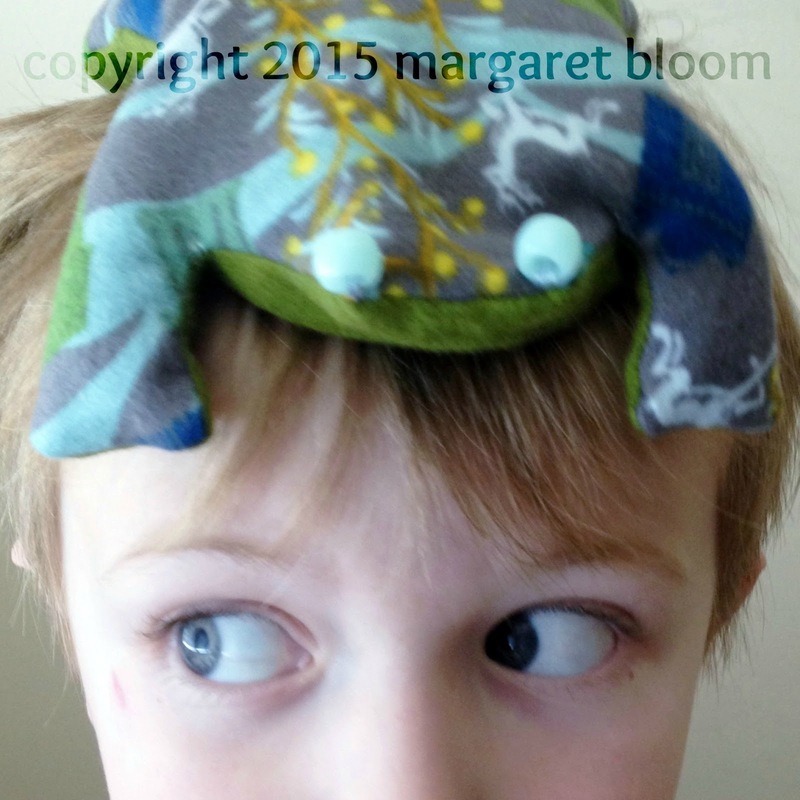 It was a little bit hard to do the blanket-stitch, but I figured it out. I started off doing the whip-stitch, but then I got good at the blanket-stitch! 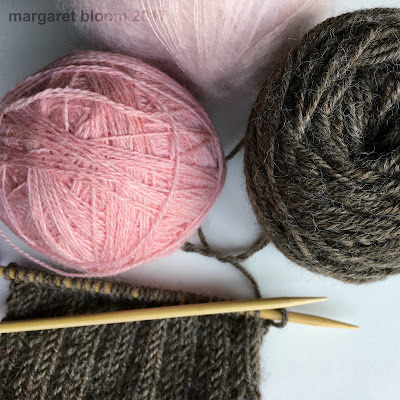 LB: And the weaving was very very very fun because you can go over and under and over and under, because it's just like swimming where you go underwater, then you come up to take a breath, and go under water again, and keep doing that again and again. LB: This weaving necklace was very easy and fun to make! LB: I made this beaded crochet chain bracelet for my mom. I added a pink button because it matched the pink yarn!! LB: My mom said maybe knitting would be too hard for me and that I could learn when I was nine. But I kept asking her to show me, and then she showed me and at first I was very frustrated and then I learned. And I'm not nine. I'm still seven! I love knitting -- I want to knit all day and never stop. Thank you Nicole Blum & Catherine Newman! 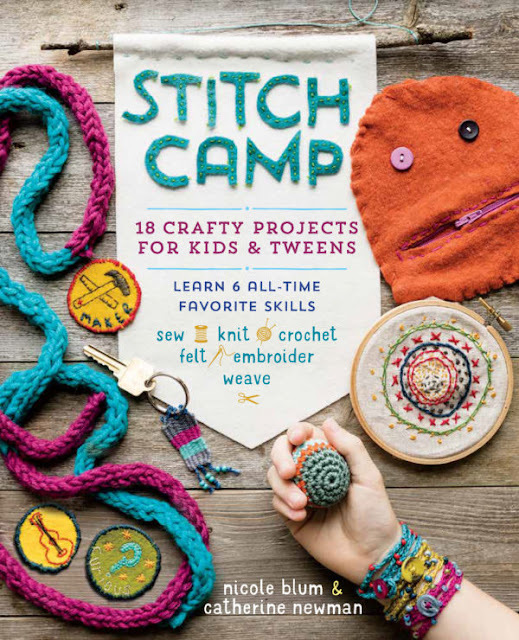 Thank you Storey Publishing for this fun book! Thank you LB for helping me write this review! and make a groovy lemon pie? I originally made this door mat in 2011, and have made new ones since then, replacing the mats when they wear out. Is there any better way to create a welcome than with a big, bright symbol of openhearted love? STEP 1 :: Use scissors to cut a heart shape out of the newspaper sheet. 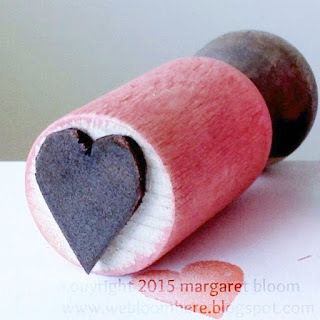 Place the newspaper with the cut-out heart over your coir mat. Tape in place (optional). 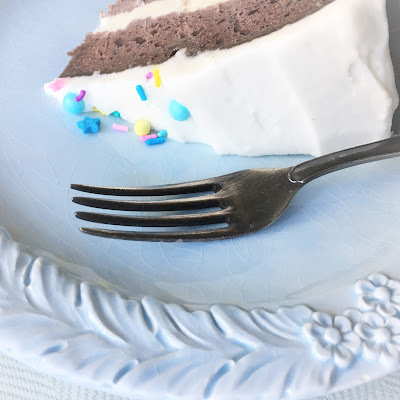 STEP 2 :: Pour some paint onto a paper plate (or other disposable container), dip brush into paint and dab paint inside the newspaper heart stencil. STEP 4 :: Welcome all who cross your threshold with an open heart. in this life, to love and be loved. Not just on Valentine's Day, but every day, shouldn't our actions always come from a place of compassion and our words express what is good + true within our hearts? Perhaps this is why I have been stitching, sewing, knitting and felting heart shaped projects. Without stop. Without end. STEP 1 :: Use a pencil to draw a heart on your piece of paper, and cut it out with standard scissors. Note - the heart I cut out is 3 in. (approx. 7 1/2 cm) high, but you should feel free to make your heart pattern as small or large as you please. STEP 2 :: Use pin to secure paper pattern to a single layer of felt. 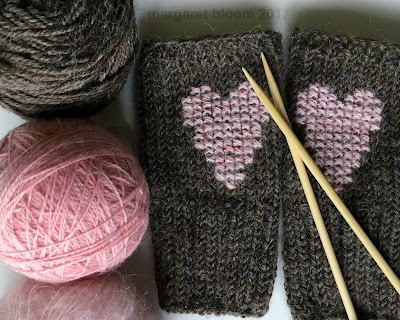 With pinking shears, cut around the outside of the pattern (i.e. do not cut the paper), leaving a 1/8 inch (3 mm) pinked perimeter. 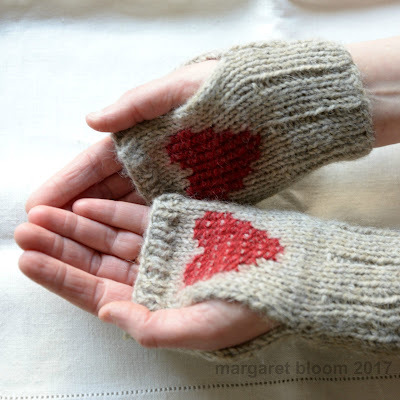 Then repeat and cut a second heart from your felt. Note - if you do not have pinking shears, don't let that stop you from making these little hearts... you can use a regular scissors to create hearts with smooth edges. 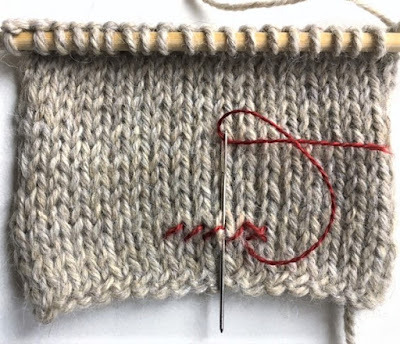 STEP 3 ::Thread a needle with embroidery floss in a color which contrasts with the color of your felt. I used red felt and white embroidery floss, but you should use whichever colors make your heart happy! 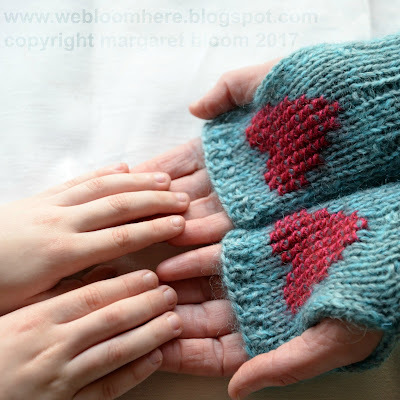 STEP 4 :: Use a running stitch to sew the two felt hearts together, leaving approx. 1 inch (25 mm) open for filling. STEP 5 :: Fill with dried flowers (and if you don't have dried flowers on hand, you can cut open an herbal teabag -- chamomile or peppermint teabags would be perfect for filling these little sachets). STEP 6 :: Sew up the opening, add a loop of embroidery floss at the top (optional), and you're done. These velvet hearts are so soft and simple. I have given them as tokens of friendship and also offered them at times when friends or their children (or my children) needed comfort. They are small enough to keep in a pocket or on a bedside table, and they feel lovely when rubbed between the fingers or against a cheek. STEP 1 :: Use a pencil to design a heart shape on your piece of paper and cut out with scissors to create a pattern. Note: my hearts are approx. 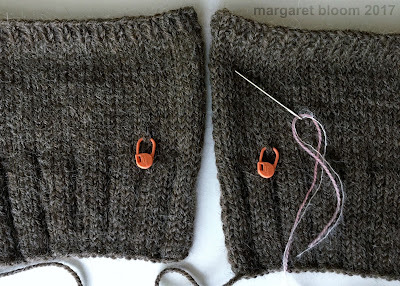 3 1/2 inches (9 cm) tall, and so, to account for seam allowance, my pattern is approx. 4 inches (10 cm) tall. STEP 2 :: Fold your velvet with right sides together, pin your heart-shaped paper pattern to the fabric, and cut out velvet per the pattern. STEP 3 :: Remove paper pattern and pin the velvet hearts with right-sides together. Thread your needle and use small stitches to sew around the edges, leaving approx. 11/2 inch (3 cm) open for stuffing. STEP 4 :: Use the unsewn section to turn your heart right-side out, add stuffing and sew closed. STEP 5 :: Give your heart, with love, to someone you care for. 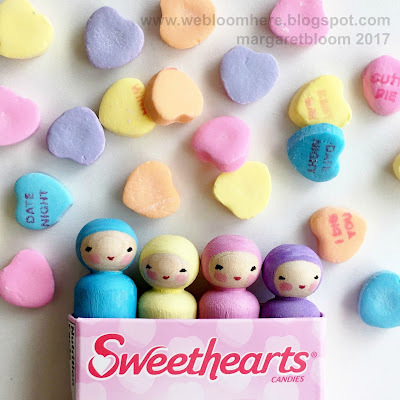 This little peg doll craft is a repeat from two years ago, but these sweeties are so perfect for creating peg doll gifts and Valentines, that I just can't help pulling them out of my hat again this year. 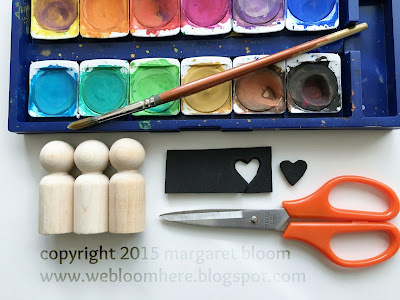 STEP 1 ::Use watercolors to paint your peg doll, and allow to dry. STEP 2 :: Cut a shape from craft foam. 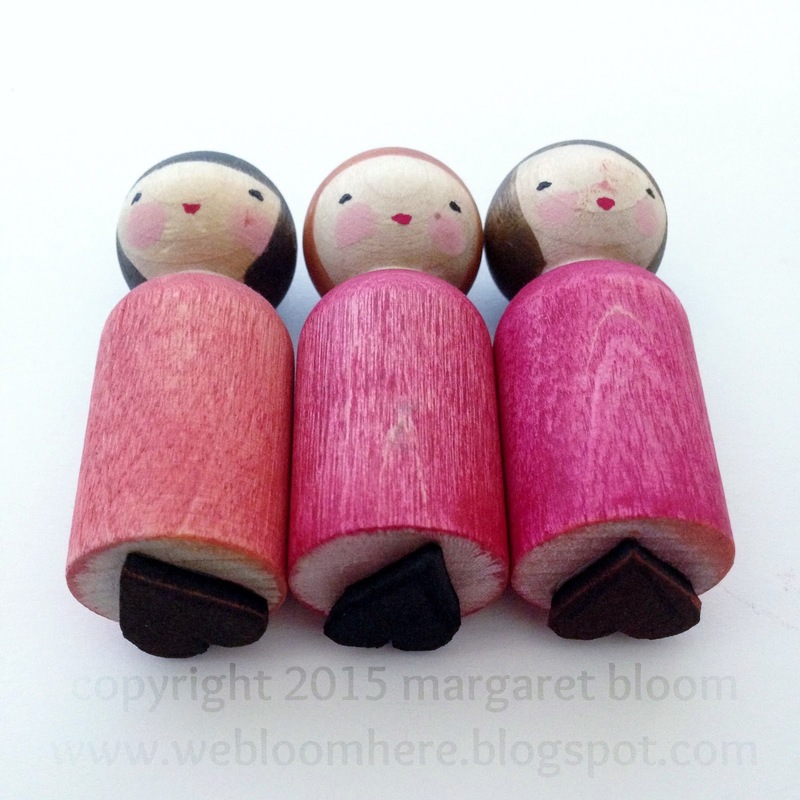 The shape you cut should be smaller than the diameter of the peg doll base. STEP 3 :: Glue your foam shape to the bottom of the peg doll and allow the glue to dry for at least an hour or two. 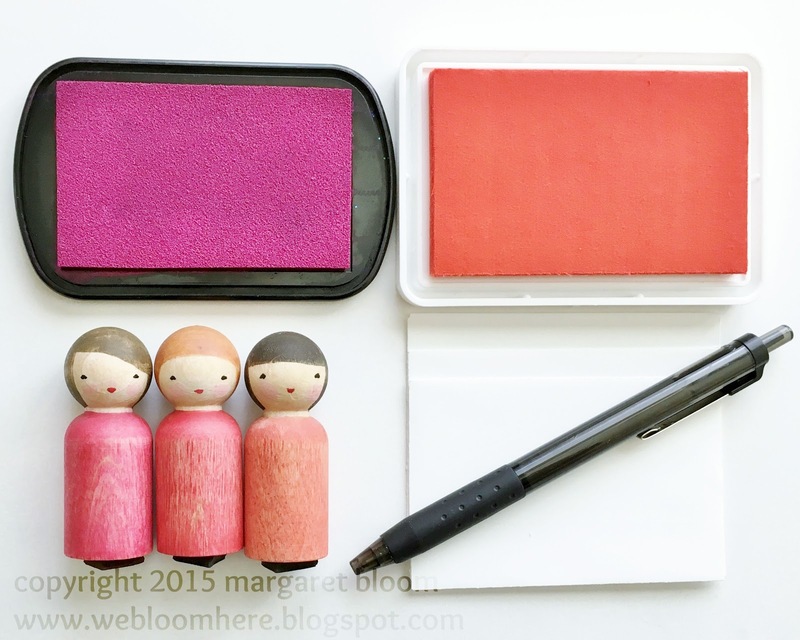 STEP 4 :: Have fun using your stamp! Note: If you use water soluble glue, be careful washing your stamp. I find it's best to clean these stamps by dampening a paper towel and gently wiping off ink residue. I adore Valentine's Day. Some people fuss that it's a holiday invented by greeting card and chocolate companies to part us from our money, but as far as I'm concerned... a holiday celebrating love + friendship? Hooray! When my older son started kindergarten and he had to make 20+ Valentine cards (one for each of his classmates), I was secretly thrilled. The world can never have too many doily-bedecked, kindergartner-scrawled cards. Now that my second son is in 2nd grade, we still go full-force into Valentine production every February, and this year we made the sweetest Valentine necklaces. Simple and perfect. Just a small felt heart strung on a piece of embroidery floss -- "a heart on a string," if you will. STEP 1 :: Use fabric scissors to cut small hearts from felt. 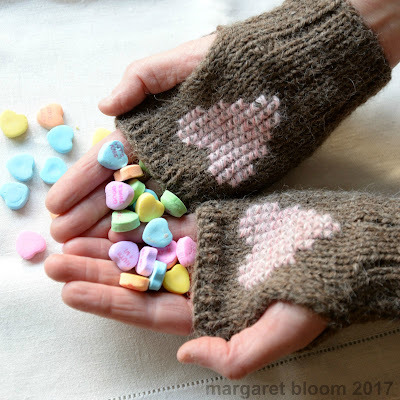 Our felt hearts are approx. 1 in. (25 mm) long, and we used traditional Valentine colors, but you could cut your hearts larger or smaller and in any rainbow of colors you please! STEP 2 :: Cut 15 in. (38 cm) lengths of embroidery floss. STEP 3 :: Thread needle, string a heart onto each piece of floss, and pull through so that the ends of the floss are even. Tie a knot just above the heart and then knot the ends of the floss together to create a necklace. STEP 4 :: Try on a necklace and admire yourself in the mirror because you have good taste and are well accessorized. Keep one necklace for yourself and give the rest away so that everyone you know will be well accessorized, too. Dear Lovely Readers! It's finally February and time to re-post my favorite knitting pattern of all time (immodest to say, since I created the pattern, but I do love it so... hearts, valentines, soft colors, warm hands... love love love).